Dr. Louis Samuels was one of the surgeons who performed the heart transplant on Jack Bogle in 1996. He remembers the man for his energy, will power and "unwavering spirit to live." It was 1996 and the founder of Vanguard Mutual Funds was waiting on the top floor of Hahnemann University Hospital in Philadelphia for a new heart. He was one of thousands of Americans suffering from end-stage heart failure, a condition with a life expectancy measured in months. Despite the gravity of his ailment, he conducted business in his room, staying up to date with the news while receiving pills and intravenous medicines to maintain vital signs that could flatline at a moment’s notice. The fact is, his ICU room was transformed into an office. Yet, in the face of his medical condition, combined with the fact that the wheels of Wall Street keep turning under any circumstances, I was profoundly impressed with the down-to-earth way in which he interacted with everyone. I couldn’t help marveling at his upbeat personality—the jocularity, the boisterous voice, the friendliness he and his family displayed to all the hospital workers and health care providers that came in contact with him. In my mind, it wasn’t only the medicines that kept him going, it was his unwavering spirit to live. I was one of the two surgeons who, on February 21, 1996, took part in the heart transplant that allowed this man to continue with his career accomplishments, contributing meaningfully to the financial community at large and to the friends and family he cherished so much. And 21 years later, we celebrated the anniversary of that event at Thomas Jefferson University—Dr. Rohinton Morris and myself (the two transplant surgeons), among many others in attendance, including Jefferson’s hospital president, Dr. Stephen Klasko. To put things in perspective, the half-life of a heart transplant is 10 years and here we were at 20-plus years and going. It was a fitting outcome for a man who set records in so many ways. 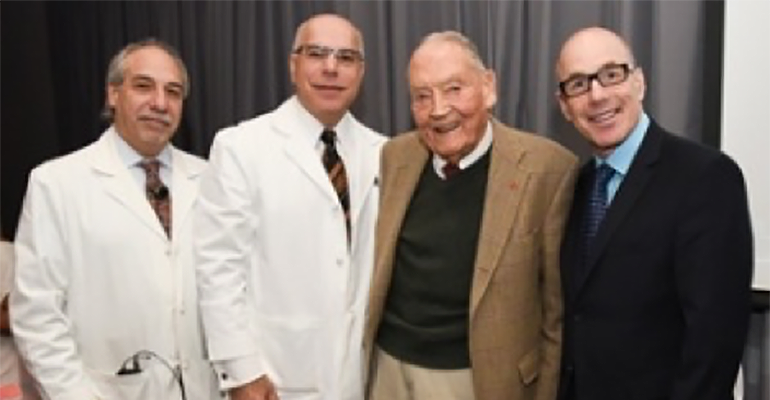 (L-R): Dr. Louis Samuels, Dr. Rohinton Morris, John C. Bogle and Dr. Stephen Klasko at the 21st anniversary of Jack Bogle's heart transplant surgery. My encounters with Jack Bogle began with medical dialogue but quickly turned to other topics, business among them. I was 35 years old at the time of his transplant; my colleague only a few years older. We conversed with the financial giant at many levels and savored his common sense advice on business matters in particular and life decisions in general. The theme of his counsel was simple—“Stay the course.” Fitting words from a man who used nautical metaphors for a living. 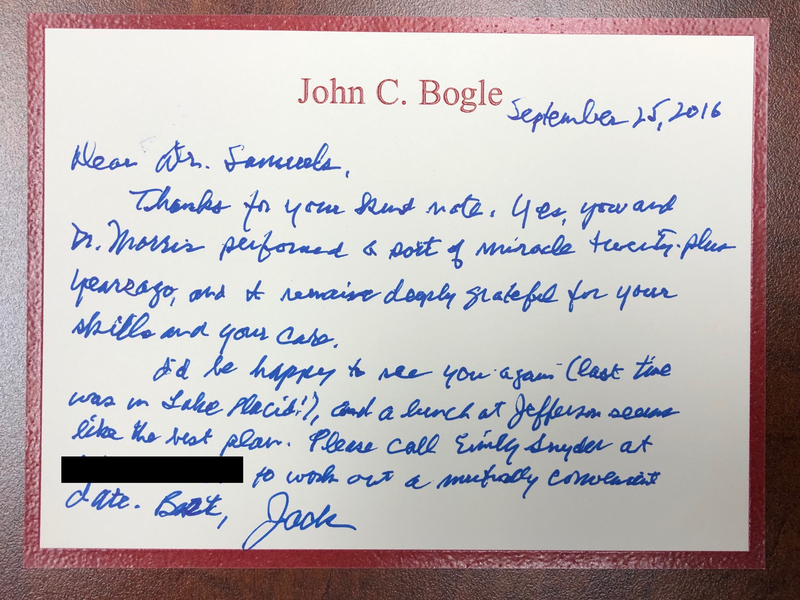 Shortly after the transplant, he gave me an inscribed book that he wrote: Bogle on Mutual Funds: New Perspectives for the Intelligent Investor. In a chance meeting in the Adirondacks some years after the transplant, he asked me if I had read his book. I said I had. “So what did you think,” he asked. “Makes sense to me,” I replied. I will always remember Mr. Bogle’s energy and will power, his constant desire to engage people and challenge the establishment. He left an impression on me and so many others. I am proud to have been a part of the reason he carried on for more than two decades, contributing so much more to the financial community during that precious time and honoring the donor that allowed him to do so. The world may mourn the loss of this great man, but in truth, we gained more from his life—both of them. We’ll stay the course. Rest in peace. Dr. Louis Samuels is professor of surgery at Thomas Jefferson University and chief of cardiothoracic surgery at the Albert Einstein Health Network.